Coventry Bees could be left with "no option" but to ground share - probably with Leicester - if plans to redevelop their current Brandon home go ahead, according to team owner Mick Horton. Planning consultants have outlined proposals to build 250 new homes on the Rugby Road site. "We've probably got about 18 months to find a new home," Horton said. "We need to protect the club and we may have no choice but to ground share - and Leicester's the ideal club." The Lions race at Beaumont Park, some 27 miles from the Bees' current home, and, although plans for an alternative multi-purpose venue that could host speedway in Rugby have been mooted, Horton says he cannot afford to wait around. Brandon Stadium, which also hosts greyhound racing and stock-car racing, has been the Bees' home since 1928. Since the Elite League was formed in 1997, the Bees have been champions three times - in 2005, 2007, and 2010. 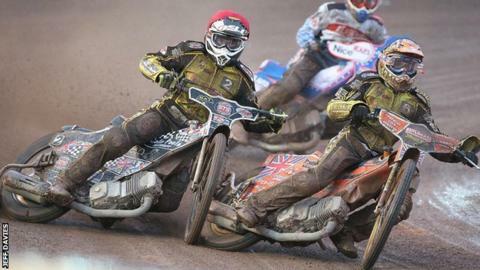 "Yes, Brandon is tired and it does need money spending on it, however it's still one of the best speedway facilities in the country," Horton told BBC Coventry and Warwickshire. "There have been meetings and there is a site they're looking at but, from a selfish point of view, I'm only really interested in speedway. "It would be great if they find a piece of land and build on it and we join them, but I've got to keep our options open. "We need to be in control of our own destiny - that's what we need to strive for." The Bees ended the 2015 Elite League season in second place in the table but lost to eventual champions Poole Pirates over two legs in the semi-final of the play-offs.